A bloody Scottish Fairy, the Ly Erg. Very little is told of this fae creature, but what we do know is that the Ly Erg prowls lonely roadsides near water in Scotland. He dresses up as a soldier and awaits for victims. He will block his marks path, raise his bloodied right hand, proclaiming that it is stained with the blood of those killed by his hand and challenges you to a fight. The best thing a traveler can do is run from him as engaging the Ly Erg in combat results in your death within a fortnight, making the Ly Erg a Death bringer, but giving you a chance to live. The Ly Erg is from very old Scottish folklore that is almost forgotten lore. From what I can infer, I believe that anyone who engages the Ly Erg and is beaten by the Ly Erg is killed immediately. I think the “Death within a fortnight” prediction makes me believe that the Ly Erg marks those who bested him in combat so that he may slay them within a fortnight to prevent his defeat from being told aloud, otherwise his boast of killing many enemies would be called to task. Basically, he is an egotistical monster channeling his anger over some long forgotten war on mortals. Lt Erg transforms into his true form should he meet an opponent he takes seriously or when he is about to murder someone. His transformation is triggered by stabbing his bloody hand with his knife to remove the glamour (Fairy Illusion Magic) around him and shows the true form of LY Erg. My second rendition of the Ly Erg shows his transformed state. 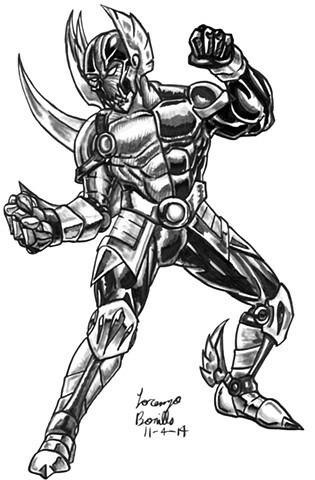 I combined him with aspects of Dc’s Breach for the facial and body markings on the armor, Marvel’s Beta Ray Bill for the winged face and feet, and with Scryed’s Kazuma for the arm and metal spike bits. He seems to also have a little Kirby influences around him with the pose and armor segments. I used a Gray brush pen for detailing sections of his body.